Welcome to the FAQs page. Check often because we are always hearing new questions! We are already on every bidders list there is. Why do we need TargetGov? We are on the GSA Schedule. Isn’t that all we need? I am listed in the SAM. Won’t that help me get business? Why is marketing important for government business? What does that mean, “build a relationship”? Should I send them gifts and special offers? Isn’t it impossible to break into government business? What is meant by “Threshold”? Is it worth pursuing that business? Are emails a good contact method? Direct mail seems to be so old fashioned, is it worthwhile? What is a Capability Statement? How can TargetGov help me? Bidders lists are good for bidding along with many of your competitors. Wouldn’t you like to get in the door before the bid is written? Wouldn’t you like to be able to go after the business that never goes through the bid process? The GSA Schedule is a very helpful purchasing vehicle for many Federal agencies. But it does not guarantee your any business. Over 50% of the companies on the GSA Schedule have zero sales on that contract. A GSA Schedule basically gives you a pre-approved list of services or products to offer at specified prices. It is often considered a “hunting license.” It also helps you to get paid faster, but it does nothing to help you get in front of the agencies, offices and people who buy what you sell. It is still your responsibility to market your business to the right people at the right time. It is vital to be listed in the SAM. If you are not, you will have a tough if not impossible time getting paid. But is does nothing to help you market and sell your products and services. You still must market your company. To the right decision-makers. People who buy for the government want to find the best value for the money. They want to know that the contractor they are choosing can do the job for the stated price, on time and within budget. If they do not know who you are, or anything about you other than what they read in the RFP or bid reply, they have a tough time feeling confident in choosing you. It is up to you to make the effort to build a relationship with them and focus on your core competencies, differentiators, and past performance. Think about how you make purchasing decisions, especially big ones. You usually feel best about making an informed decision if you know something about the vendor, if they have a good track record, if the price is reasonable and if they have done any work for anyone you know. It is similar with government relationships. You must spend the time and effort to find the right office and person within that office. They need to take the time to get to know who you are, what your company offers and where you have worked in the past. They are responsible for making very expensive decisions with a lot of complicated legal processes. The easier you make it for them, the better chance you have of getting business. No. The government has very strict laws regarding gifts, meals, travel and other expenses. If you cross the line, even inadvertently, and send the procurement officer any item or special offer, you risk causing them problems and legal issues of your own. When in doubt, don’t. Actually, it is getting easier. The purchase card (like a government credit card) has made it easier to get paid. Agency Directors are setting standards for government employees to open the door to vendors, and the Internet is making the process more streamlined by using electronic bid and payment processes. Prime contractors are looking to hire subcontractors to help meet small business goals. All in all, it is getting less cumbersome, that is, if you understand the process, have done your homework and know who the people are to contact. Over the past few years, federal civilian and DoD government agencies generally have loosened their procedures for making small purchases (those under $150,000). They can now be made with three informal quotes obtained by telephone, fax, email, online bid systems such as FedBizOpps or regular mail. Payment is made with a credit card or purchase order. The quotes themselves make up the purchase documentation so a buyer can act quickly and efficiently. Official buyers or contracting officers often make small purchases for program managers or end users. Since the end users may or may not provide buyers with preferred suppliers it is your challenge to market your company to all the people who may be making these decisions. They cannot mention your company as a preferred vendor if they do not know who you are. Every federal government agency actively makes these Simplified Acquisition purchases for both services and products. This is legitimate, less complicated business that you will never get unless you know who the people are who make those decisions, and just as importantly, that they know you. In this age of ever-increasing spam, you must make a decision to be very judicious in your email use, or risk being black-listed as a spammer. If you send out hundreds or thousands of bulk emails to a list, you will probably alienate more people than find good business opportunities. It is best to ask for permission to send the email and have a specific, brief message. Yes, but again, only if it is sent to the correct people and in very small batches. Many government mailrooms have the authority to dispose of bulk mailing of 50 or more pieces to one office in one day. This means if you blanket mail an office in the hope of hitting the correct people, you run the risk of your expensive pieces being thrown in the trash and never getting to anyone. What are our features? What are the differences in our products and services? A well-crafted Capability Statement opens doors to greater revenues, new agencies, and will set you apart from your competitors. It is a tool critical to the success of any size organization pursuing federal contracts. This document provides proof of qualification and past performance and is required in the government registration process. TargetGov offers a class Writing a Powerful Capability Statement through the Government Contracting Institute as well as on-demand training. Classes are scheduled regularly, so check back often in our upcoming events. 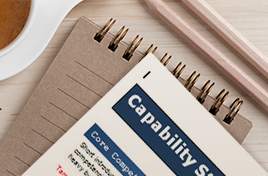 Choose from four different styles of templates to help you create your capability statement. Use the TargetGov Capability Statement Editable Template to ensure that you have included all the information the government is looking for. This template will help keep you within the length guidelines. When finished, you’ll have a document ready to present to government officials. This easy to use template is Word based. You can simply replace the prompts with your own information. You can edit the colors and graphics to fit your company’s look. The exclusive TargetGov tips will keep you on track. To order click on your preferred template style. They are available for instant download. This is one of our popular products from our website. This is a custom version of our popular templates. What we do: We take a look at your website and logo and create a template for you based on your current branding and color scheme. This template does not include any verbiage in the Capability Statement. We do include guidelines for how to proceed in putting the verbiage together. Take a breath! We can do it for you. Work smarter, not harder. It takes real work to develop the content for your essential Capability Statement. You cannot move forward in government contracting without it. Work with TargetGov’s experts to develop a solid Capability Statement that works for you instead of against you. This is a consultation service where the end-result is a complete and fully-functional Capability Statement. This Capability Statement is branded toward your website and logo and includes additional time spent with a consultant refining the verbiage of your Capability Statement. Also includes time spent tailoring it towards a specific Agency, Prime Contractor, or even an Opportunity. You will have to provide some material to us in order to develop the exact verbiage, but we work closely with you in order to provide you with a complete Capability Statement.